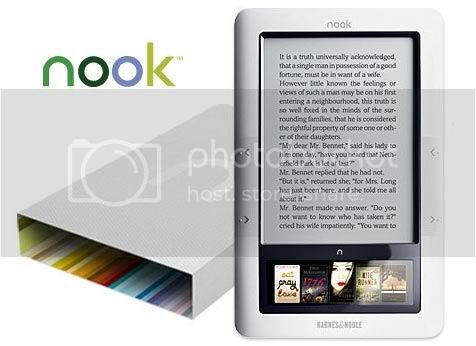 I just received a B&N nook for Valentine's Day from my lovely wife, who probably just wanted to me to quit talking about how I was going to buy one "someday." I've wanted an ebook reader for a while now. My only real hobby these days is reading. Over the last three years, I've probably averaged about 85 books a year. However, I don't buy a lot of books. I'm a big library user and visit the used book store once every couple of weeks, but buying new books is pretty rare for me. This makes the idea of an ebook reader less attractive because library support for ebooks is pretty limited. However, I still wanted one because of the convenience and other advantages they offer. I had settled on the nook for a few reasons. The first is that it is based on the Android platform, which opens up a wide range of future possibilities. The hardware is also nicer than the other offerings, and more attractive. Features like "LendMe" caught my attention, too, though I believe it sounds better than it actually is. The Kindle is the leader and normally, with new technology, it makes sense to go with the leader but I like the nook and think it has a decent future ahead of it. I've now used my nook for about three days. I am very pleased with the reading experience it offers. The text is very sharp and does indeed look almost exactly like paper. This is one of the big advantages of the E-Ink technology over something like an LCD screen (like the iPad, your phone, or your computer screen). It is not backlit, so you do need an external light source. This is a good thing, though, as it reduces eyestrain and allows for longer reading sessions. Another advantage of E-Ink is that once the screen is painted with the text, it takes no power to continue displaying that page. This greatly increases battery life and should make charging a once-a-week occurrence, at most. Books can be obtained from various sources thanks to the multiple formats supported by the nook. The main place, of course, is the B&N Ebook store, which is the only one you can buy from directly from the nook. You should be able to buy from other large vendors, like eReader.com and Fictionwise, though I haven't tried it. The nook isn't perfect, though. Navigation is done via a small LCD touch screen at the bottom of the device. This is attractive and all, but it is very sluggish. Thankfully, not much of your time will be spent on the LCD. Once you choose your book, you are just flipping pages. However, if you want to look up a word in your book, you still have to use the LCD to navigate down the page to the word and hit the define button, which is just painful enough to make it a rare occurrence. Also, the LendMe feature, though it sounds great, is sort of lame. The feature allows you to lend a book to someone for 14 days. That's good, but the further limitations cripple it. You can only lend a particular book once, ever. Also, the ability to lend a book is up to the publisher and support for this right now appears to be pretty low. Hopefully B&N can address some of these issues in future updates. However, as it is today, I am enjoying reading on it.